This week’s theme is Fruits From Trees. My mind started racing and wandering as soon as I read the theme for this week. We actually have three different types of fruit trees and recently bought three more. One of such trees happens to be a lime tree. I love limes so so much. They re so good, and well us Persian love our Persian Lime. 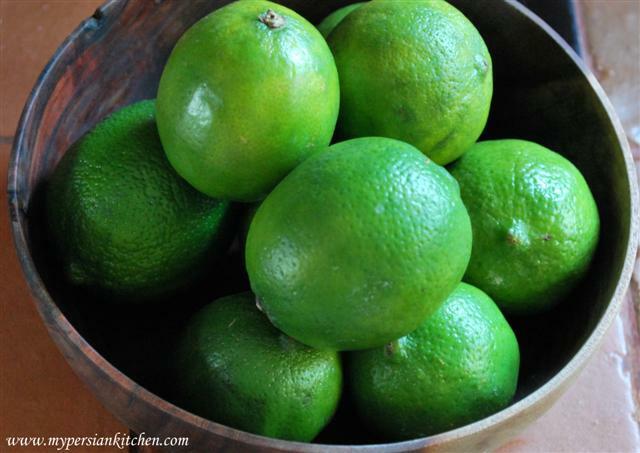 After having purchased our lime tree I found out that there are a couple of varieties of limes and the one that we have is actually a Mexican lime. Anyway, you will often notice that in Persian cuisine limes are used pretty often. In fact they are used both fresh and dried. Our limes are currently super small. I can’t wait to harvest them sometime soon…well soon being the key word here. But I check on them everyday and pray that they will make it through our hot summer days. Anyway, for today’s post I want to talk about a fun drink that I thought of a couple of weeks ago when I wanted something refreshing with a twist. This is my own twist on the well known shot Lemon Drops. I love Lemon Drops and often wished that it was not just a shot but an actual drink. My version is a simple drink to make, and it is so good to sip on a hot summer evening. As a matter of fact mine is sitting right here as I am typing this post! So here it is: Ladies and Gentlemen, Children of all ages above 21, I present to you, Persian Lime Drops! Pour all ingredients in a shaker and guest what? Shake well! Pour in a martini or any other type of glass. You can totally get creative with this drink and go as far as putting sugar on the rim of your glass. You can also adjust the amount of vodka to your taste. I know in our household the way The Sous Chef makes drinks are a little dangerous and my eyes cross at the first taste, and when I make them, he has a tendency of adding more alcohol. I am all about subtle and enjoying the various flavors! As a matter of fact I enjoyed the first one so much that I just had to get up in the middle of writing and make myself another one! I will conclude this post with a tip. wink wink wink! 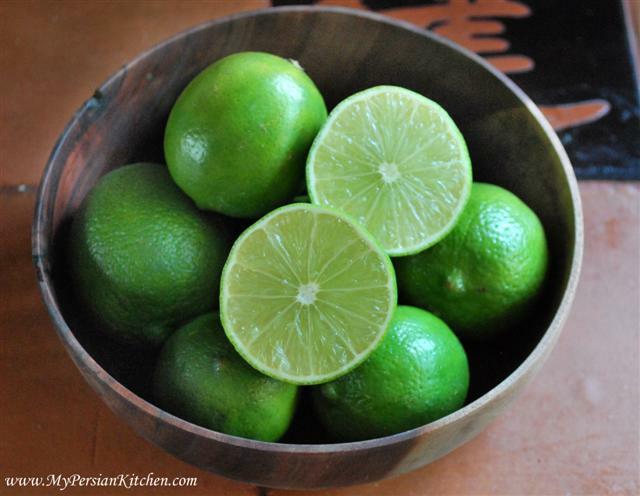 Instead of throwing the squeezed limes in the trash, throw them in your sink food disposal along with the ice cubes that you used to make the drink. The limes will release a fresh citrus scent making your kitchen smell nice, and the ice will sharpen the blades, or at least that’s what I learned on a Epicurious podcast. Yes, I am that much of a food nerd, I watch food podcasts on my ipod. Watching food podcasts on a Ipod makes you food nerd…sign me up. I do the same. 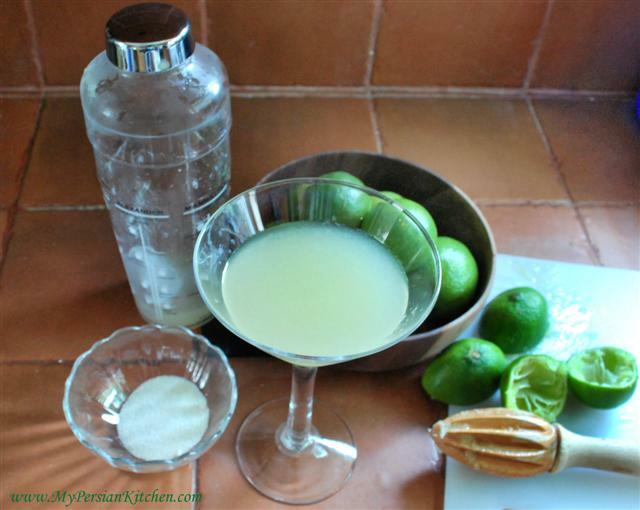 Drink looks delish…Lime and Sugar was my favorite when traveling…adding vodka can only make it better! Thanks for sharing! I can’t wait to hear all about it when you give it a try Jenn! love that you grow your own limes! 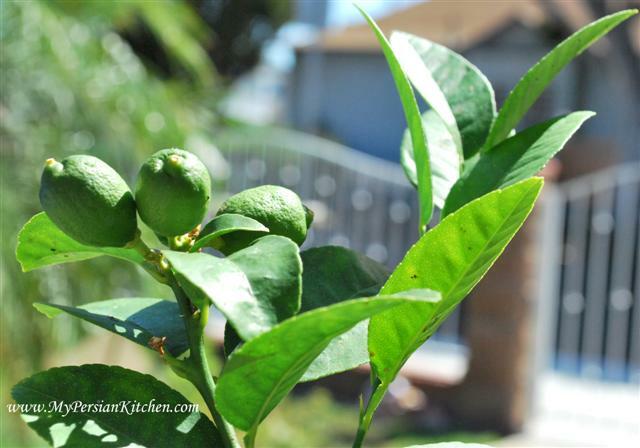 i have kalamansi limes growing – they are still very very small too. Thanks Jaden! It is fun. I check on the every day! You know, come to think about it I don’t think I have ever seen fresh limo amonee. Its the secret ingredient to the best way to wow your American born friends with your amazing Chicken Soup. I agree, I have never seen fresh limoo amonee, I figured that it was simply dried persian limes, but limoo amonee has seeds…nevertheless, it makes everything taste delicious! I recently discovered Lemon Drops at a party. And I loved it. Now, Persian Lime Drops! I can’t hardly wait to try it. By the way, Jaden, I noticed you mentioned kalamansi. Are you filipina by chance? (I am!). I am growing figs and like Jaden, cant hardly wait to see how many fruits I will get. I love figs, goat cheese and honey on a home rolled pizza dough.